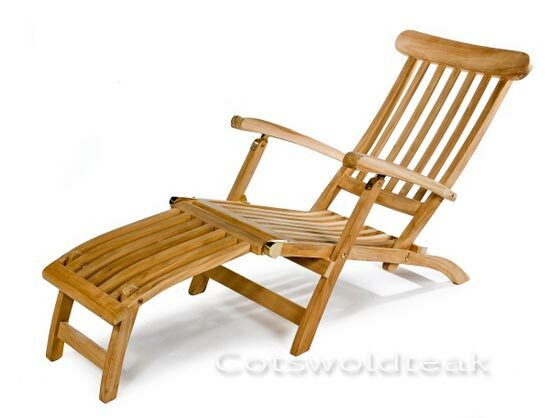 The Cotswold Teak Steamer Deck Chair allows you to relax in style. 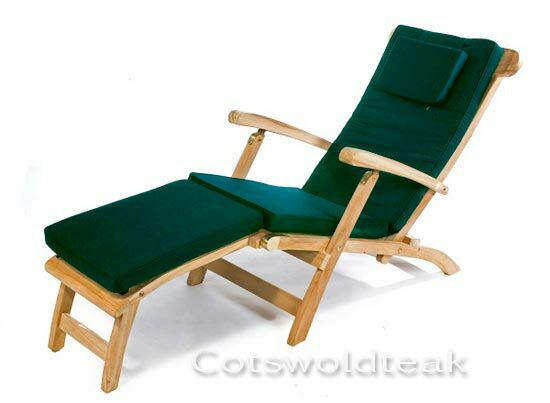 The multi-position reclining option allows you to sit upright or lay back. The slatted design and traditional joinery techniques add distinct durability. Fully fold-able for convenient storage and portability. The Steamer comes with full length green or blue cushion for your comfort. Ordered this Steamer chair and Cushion on a Sunday night, received the items on Tuesday afternoon. Fantastic chair and great service. The chairs are excellent. I fully agree with the reviewer who said they were so much better than the ones you can get at DIY stores and elsewhere online. Sturdily built and with a high quality finish. The cushions are comfy and fit the chairs nicely. The chairs were out of stock when I ordered them but they arrived on the stated delivery date. The only trouble is that our adult sons like the chairs so much, we might have to buy two more! Very pleased with these chairs, so much better than the widely available competition at diy stores. Very prompt delivery. I'm absolutely delighted with the pair of Steamer chairs. Quality product, fast delivery and great cushions. Excellent value for money. Just waiting for some sun. Would highly recommend Cotswold Teak. The steamer and cushions arrived quickly and in good condition. I am pleased with the quality and the comfort. With the fine summer weather, I have been relaxing in the garden ! Click the button below to add the Steamer Chair with Cushion to your wish list.